7am start, way earlier than the usual. Headed up to Tom Priers whare (a last minute addition to the trip, he spent all summer in Morzine, so over dinner the other night Jamie and I convinced him to come on a roadie), loaded his gear into Morty, dropped excess gear at Jamie Nicoll and Elena Munstermanns’ house (aka Elenas’ house, the post shop, thanks guys!). Left Morzine, France at sparrows fart (or what felt like it) en route to Geneva to pick up fellow kiwis Tom Bradshaw and Charlie Murray for a last minute booked trip to race the last two rounds of the Enduro World Series. Arrived in Geneva on time and completed the usual too many laps around the airport trying to find them. Finally connected - stoked they came over! Tom was packing a team uniform for the two weeks that couldn’t be more kiwi (sheep shirts with matching sheep hats)! His flatmate Georgia made them by hand, so rad, they’re rad. Chucked the boys and all their gear in Morty and boosted, destination Aìnsa, Spain (current time 9.30am, eta 7.30pm). Six hours in we grabbed a swim stop at a beach down the south of France close to Montpelier. We jumped back in Morty and made a million wrong turns which took us to Barcelona before heading back up the continent to Aìnsa. Bradshaw kept us entertained with desert riddles (you can take a spoon to the desert, but not a fork). Got to our destination in the end, driving up a castle road to the top of king Aìnsa’s whare to find the perfect camping spot next to Loui Harvey and Jess Enlund (arrival time 11pm - 16 hours travel time, sheesh). Had yarns before shuteye. Woke up at the top of the castle paddocks, taught Bradshaw how to percolate the morning coffee (big pro percolator here). Kitted up and headed out for a spin around on the bikes. The terrain here is amazing, grey earth with mini rampage spines all over the place. Played around a bit and managed to pull a stop to scorpion in the process (would have been prime for jerry-of-the-day content). Biked down to the river for a swim, it had rained the day before so everything was pretty murky. After 10 mins of swim time a snake just floated on past, and that was the end of that swim. Headed to the supermarket, bumping into half the EWS field along the way for chats. Chilled out up at camp for a bit then picked up rego packs before heading down to kiwi Melissa Newells’ (Mops) house for dinner, and some yarns. Up and on the percolator for morning coffee duties at campsite take 2 (we got moved on from our campsite to another good site, still up above the castle). Spencer Cathman offered to shuttle us to the top of stage one, legend! The team piled in and headed out for a day of course recky. Team Manager Tom managed to score a team plate and came out for a blat. Stage one was a huuuuuge pedal, but pretty fun descents in between. Two was a rim destroyer, three was full noise flow and four was short as (800m long). Pretty happy with the stages after pedalling out stage one (flashback to XC days). Headed back home after a biggish day out on the bikes and straight to the river for a couple hours of chill time. The water was way clearer by now (no snakes!) and such a good setting. Everyone ended up at the river which was pretty cool scenes for an EWS. Headed back up the top to get the bike all pretty and a little more prepped for race day (changing tyres and making sure everything was running smooth) - no correlation to Steve Murphy and Lina Skogould turning up for a visit. Spencer and Paris shuttled the gang up to stage five to start the day, bloody good day with no clouds in the sky and pretty hot weather! We headed down five which was a snake of a track, weaving its way down a grassy ridge. Onto stage six and seven getting it all done pretty quick. Headed to the river and got all the bike admin done nice and early. We then had to race a prologue event through the castle from top to bottom, but the time didn’t count towards anything. So it was a prologue that you had to race, but didn’t need to race? Pretty fun anyway! Headed straight to the river after with Tom Sampson for another swim! The Spainish boys in blue came by the campsite and noticed our awesome sheep shirts, we had a yarn and it was kind of funny, then the mood changed quickly to serious, Tom and I then got searched (Tom more thoroughly then I) for drugs haha. We were watching the nervous couple across the campsite that were actually smoking the weed that started this whole search. They ended up leaving and then some more officials came and moved us on again to another, even better campsite, still at the top of the castle. Headed into the castle for the Aìnsa sausage party (kind of ironic lol). The town had cooked a 900m long sausage to feed the locals and athletes for dinner, it turns out that is a huge amount of sausage so they let us take an extra three metres or so for snacks and tomorrows dinner - classic for us camper bums. 8am start with the sun pretty heated and no clouds for cover. Team sheep got kitted and headed out to start the day. We got shuttled to the bottom of stage one and then had to wait forty minutes before we could start our ascent, we then had two and a bit hours to climb the hill.. so much time. We got there in the end after many breaks and a bit of heckling. Got to see team sheep drop in before warming up and heading down stage one. Stage one started with a straight rocky descent before heading up a fire road climb and then into three minutes of flat traversing. It then headed down a fast kind of chicaned trail before coming out onto another fire road climb which flattened out for a minute then dropped into fast single trail straights with tight corners around trees, flowing into another high speed chicaned trail, finishing with grey earth trails. I had a pretty good run down here apart from catching the odd person right at a climb and having to get off and run up, not ideal, but how it goes. Nice big feed zone at the bottom to top up the camel with water. Headed up the same climb to take us to stage two. I caught up to team sheep on the way up and Bradshaw had started sweating up a storm. We peddled on for a bit and he disappeared off the back, turning up a bit later at the top of the hill after a couple of cheeky vomits. He was still chippa as so we didn’t think much of it. Stage two was fun with a lotta awkward corners with boulders that you had to manuever around at speed and then a whole bunch of sniper rocks littering the trail. I had a good run down here and managed a 26th on the stage :). Caught up with Bradshaw again to find out he had vomitted more, and was starting to feel awful, but was still chippa as. A small pedal over to stage three, Bradshaw left after three and forgot his bottle, so I pocketed it. Stage three was fun and flow on loose rocky corners. I was having a lotta fun down here really pushing myself and ended up having a huge stack on a tight right hand corner, losing the front wheel and throwing a scorpion for the crowd. Finished off the stage annoyed, but happy I was pushing my limit. Pedalled straight over to stage four all stoked to give Bradshaw his bottle back, I headed to the front of the line to find Charlie and group of people surrounding and cooling Bradshaw who was now in the recovery position. He was suffering from extremely bad heatstroke. I headed back up the road to find an ambulance and radio in some help. Headed back to the scene with Daniel Wolfe fanning air onto Tom saying he was his biggest fan haha. Tom was in a state though and started looking badly ill, the medics eventually turned up and stretchered Bradshaw outta the heat and onto a drip. Charlie and Loui did a bloody good job and huge thanks to all the riders that helped Bradshaw out! We all dropped into stage four not long after (shot as trail on grey earth) and headed back to visit Bradshaw in the medic room. He eventually headed to the hospital just to be safe, and Spencer and Paris the legends picked him up at midnight. We headed over to Mops for dinner, minus one sheep and prepped for the next day. Another heater of a day! Pedal into the castle and loaded into the shuttle headed for stage five. Another big wait before starting the stage always leaves time for good banter. Stage five was grassland with a trail carved in with many sharp rocks and large rock slabs to manoeuvre on, it then headed into the trees for a couple of high speed sections and a few tight corners. I rode conservatively on this stage, but still managed to crash on one of the rock slabs - just losing grip on the light layer of dust that had been ridden on to all the slabs. On to the feed zone and stage six, the temperature was rising making this shorter day still kind of hard. Stage six was a smooth trail with a lot of pedals for the first eighty percent of it then finished with an open grey earth section, with a fast rollercoaster like feature (rolling corners, quick drops). I started the stage fast and rode straight into a tree 50m in, on a fading left hand corner haha.. the rest of the stage went well! Back to the pits for smoko and then off up the last climb heading for seven. Stage seven started out on a ridgeline walking trail before dropping into high speed open sections, it then had a two minute break (untimed section) before starting up again into high speed chicanes, followed by tight switchbacks and narrow trail. I had a good first half to the stage, but on the first corner after dropping into the second half I lost the front wheel on a corner and the bike ended up getting tangled in a bush haha.. After a lot of yanking it came out and I finished off the stage, a wee bit annoying, but just gotta stop crashing. Finished the day in 57th. Tidied Morty up, had coffees, picked heatstroke Bradshaw up and boosted straight into the wrong direction with Charlie at the wheel. Corrected that and made tracks for Santa Coloma de Farners, Spain for a great camping spot next to an old castle. Heatstroke Bradshaw cooked up a mean bean pasta meal with all the accumulated leftovers, yummy. DJ Gastro Returns. Woke up after a very average sleep and headed out for a pedal around the trails, we hit the hills hard and got in three good trails, would recommend this place for a visit. We headed out of town bound for Nice. Charlie got hit early on with a fever and later on in the day I got hit. Feeling spewy and achy and overall a bit rubbish, DJ Gastro had returned. We turned up at Toms mates house Anthony for five star accomodation, couldn’t eat a thing though haha and I couldn’t sleep all night so the party was livid, you had to be there. Still feeling average, but headed out for a hugey of a ride with Anthony and the boys to blow it out. 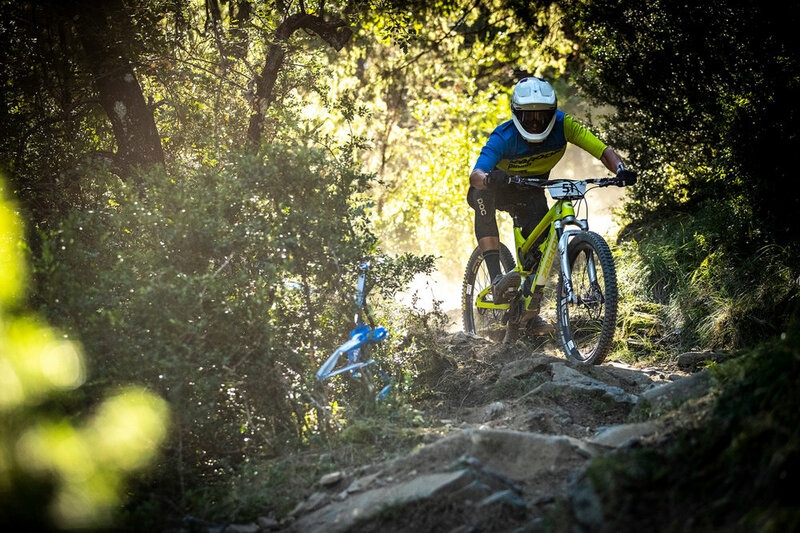 Good times in Nice the trails here and scenery is amazing!